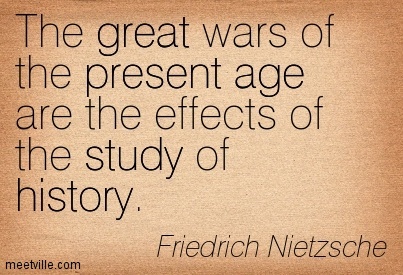 Last week in our Theories in Modernity class we looked at Nietzsche’s essay “On the Disadvantages of History For Life”. It was a really interesting piece because it brought up loads of interesting questions around our relationship to history. Nietzsche explores the effect history has on human beings. In this essay he is acknowledging the need for history in order to live an active life but he is also making the point that history can become a problem if we dwell on the past too much and forget to live. This entry was posted in Uncategorized and tagged History, Nietzsche, On the Disadvantages of History For Life, Past. Bookmark the permalink.